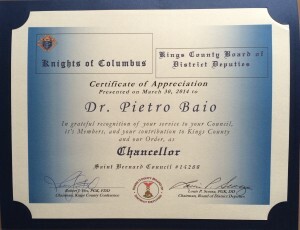 On March 30, 2014 Dr. Pietro Baio was honored by The Kings County Board of District Deputies. Dr. Baio has been a Knight since 2007 and since the start has taken a big role in both local and borough wide activities. This past year alone, on top of his duties as Chancellor for St Bernard council 14269, Dr. Baio was named to Kings County C & B & Charity Drive Coordinator. He also Chaired the annual St Bernard Golden Gloves event and was a board member for the annual St Bernards Golf outing. Dr. Baio was Honored and Graciously excepted this award. He will continue to make his make as a member of the Knight of Columbus in the local Bergen Beach / Mill Basin community as well as the rest of Kings County. Thanks for your marvelous posting! I actually enjoyed reading it, you will be a great author. I will always bookmark your blog and will eventually come back very soon. I want to encourage you to continue your great writing, have a nice day!